For whatever purpose you might want to collect data from people, get a head start and use this clean-cut and ready to use sign-up template. Match your organization’s style by picking your own logo and brand colors. Whether you’re building a potluck sign up sheet, planning your next Karaoke outing, or hosting this year’s Thanksgiving dinner, this template has got your back. Create something beautiful and engaging with fun images, GIFs or videos. To customize this template after signing up, choose ‘Sign up’ as example when creating a new survey. Why should I create an online sign-up form? We know paper forms are still widespread, but what if you were given a paperless option that only took minutes to make, fill out and process? With Survey Anyplace, you can create an interactive signup form that is short, fun, and engaging. As well as asking one question at a time, just like in a real-life conversation, these forms are highly customizable. Can I integrate my sign up form with other tools? Yes, you can. It’s one thing to collect new sign-ups, but you’ll need to know what to do with them. That’s why we integrate with Zapier, via which your sign up form can be easily connected to 750+ apps. Want to send results to MailChimp? There’s an integration for that. Use integrations to easily store new information, and build automated workflows. Why use Survey Anyplace as a sign up tool? Your sign up template is waiting for you. Create yours and start signing people up with a few simple clicks. No more worrying about if they have a pen or not. These registration forms are fun to fill in on any device. Derive new insights from analyzing acquired data as it happens. 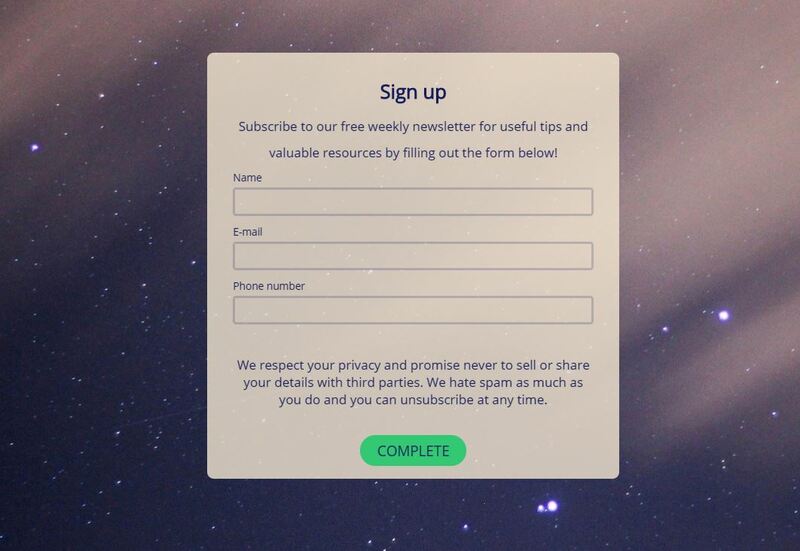 To use this sample Sign up template, sign up for Survey Anyplace , and choose ‘Sign up’ as example when creating a new survey. The truth is, every organisation and almost every website needs members. And what are members? People who SIGN UP, aside from a great signup form, you’ll also want to look at a couple of other things. A call to action or CTA, if you provide a link to your sign up template online, people need to see where to sign up. Use contrasting colors, make it stand out on your page. Guaranteeing your members’ privacy is something you’ll want to do if you want to get as much sign ups as possible. Many people are quite keen on their privacy these days. And if money is involved, make sure you offer some kind of satisfaction guarantee. Offering an incentive to your future members is also a great way to get them on your contact list. Something like “Sign up today and get 30% off” is something of a cliché but it works. Or giving them anything ‘for free’ will also give them the feeling they are getting more value and that you’re worth their time. It is important that the sign-up details can be collected efficiently and transferred to a central system immediately and automatically: mobile devices such as a tablet or smartphone are ideally suited for exactly that. Sign-ups through paper forms, pdf or word documents are also possible but has the disadvantage that the data needs to be transferred to a central system as a separate action, which is error-prone and time-consuming. In light of recent events, make sure you are 100% transparent about the intended purpose and use of your survey. If you don’t need data, don’t ask your respondents for it. Surveys can be a great way to get to know your audience and give useful feedback without needing personal info. Get more sign ups with our sign up form!